At Junk Shot, we provide a range of different commercial junk removal services. Here’s a look at some of the most popular options. If you need a lot of junk removed, our bulk item removal services may be just what you need. This is ideal for property managers who’ve just had people move out and leave behind a lot of garbage. It also works for homeowners who are doing a big clean-out project or for people who have recently bought a repossessed home or a property on a tax lien. Our bulk commercial junk removal services mean that you don’t have to worry about renting a dumpster, securing a permit to place it on the street or sidewalk, and hauling out the junk yourself. Instead, you make a call to us, and we take care of everything. We can also bring temporary fencing on these jobs. That helps to ensure that your area stays looking attractive. If you own an apartment building or a group of single family homes, you may want to consider our valet trash removal services. With this type of commercial junk removal, we get rid of trash right from the doorstep of your rental units. Our clients find that this perk helps them to attract and retain quality tenants. Many renters, especially short-term executive renters, are starting to expect services like this. If you’re an event planner or just someone planning a one-off event, our event clean up services can help. Regardless of the event, there’s always some trash left behind, but after we go through the space, you can rest assured that it is clean and back to normal. We can also help with some aspects of setting up events. When you finish a job, let us pick up the mess. We can handle all aspects of commercial junk removal for demolition companies. That includes asphalt, concrete, blocks from retaining walls, old structures, spas, hot tubs, and more. 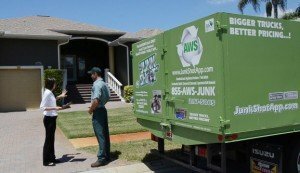 Our junk removal specialists are trained and insured so that the job is done quickly, efficiently, and safely. There are certain items that you can’t just throw into a landfill, and e-waste falls on that list. E-waste includes computers, tablets, cell phones, printers, and all other electronics. This waste has toxic metals in it, and if put into the landfill, those metals can seep into the ground water. However, when you’re getting rid of junk, there tends to be a lot of old electronics, and figuring out what to do with that waste can be time consuming and confusing. We can help by picking up your e-waste and disposing of it properly. We can offer these pick-ups as part of our other junk removal services or as on its own. In need of commercial junk removal services? Then, contact Junk Shot today. We offer upfront pricing so you don’t have to worry about unpleasant surprises or fees. We can handle everything from single item removals to large-scale projects. Give us a call and we’ll handle everything.